Nov. 23, 2005 -- The Department of Music at Arkansas State University in Jonesboro will present the ASU Ringers annual Christmas Concert on Tuesday, Dec. 6, at 7:30 p.m. in Riceland Hall of Fowler Center, 201 Olympic Dr. 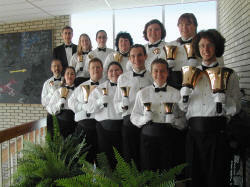 The Ringers, directed by Dr. M. Ellis Julien, professor of music, was established in 1985. The group is a small ensemble open to members of the student body as well as to members of the faculty and the community. Although most of the students are music majors, several other academic majors are represented. Over the past 10 years the Ringers have toured throughout the states of Arkansas, Alabama, Florida, Illinois, Louisiana, Missouri, Tennessee, and Texas. This fall their tour will include concerts in West Memphis and Little Rock. The program will feature “Thanksgiving Praise!” by Dan Edwards; “Manger Reflections” by Sandra Eithun; “The Snow Lay on the Ground” arranged by Cynthia Dobrinski; “God Rest Ye Merry, Gentlemen,” and “I Saw Three Ships” both arranged by Sandra Eithun; “Ding Dong! Merrily on High” arranged by Lloyd Larson; “The March of the Kings” arranged by Valerie Stephenson; “What You Gonna Call Your Pretty Little Baby” arranged by Susan Nelson; “Sleigh Ride” by Leroy Anderson, arranged by Robert Ivy; “The Rose Carol” arranged by Arnold Sherman; “Riu, Riu, Chiu,” arranged by Cathy Moklebust; ”Primrose” by Toshikazu Yoshida; and “O Holy Night” by Adolphe Adam, arranged by Douglas Benton. Members of the choir include Rusty Shields, Keith Westbrook, David Berrentine, Amy Marr, and Dr. David Gilmore, all of Jonesboro; Carly Gorman and Thomas Head, both of Little Rock; Karen Graham of Mayflower; Jennifer Hall of Tyronza; Ben Light of West Ridge; Charity McKeen of DeQueen; Nic Robbins of Manila; Caroline Sampson and Carolyn Smith, both of Huntsville, Ala.; and Ashley Tidwell of North Little Rock.